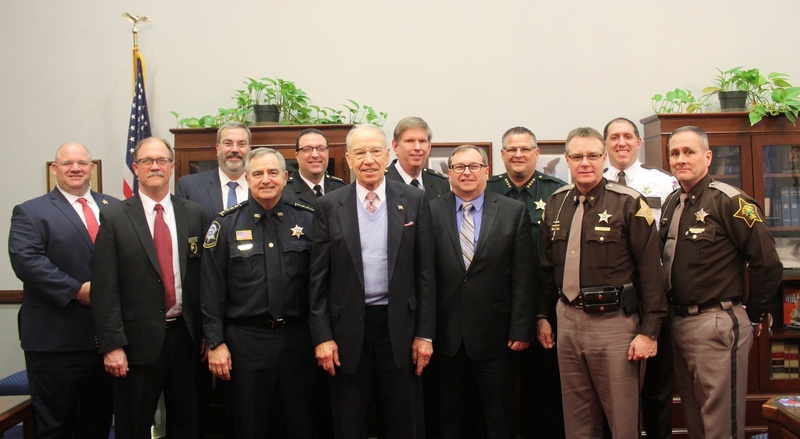 Alexandria, VA – Sheriffs and law enforcement representatives from around the country were on Capitol Hill today to meet with their Senators as well as Senate Judiciary Chairman Chuck Grassley to encourage a speedy confirmation of U.S. Senator Jeff Sessions to be Attorney General of the United States. Law Enforcement expressed that Senator Sessions would be an outstanding nominee for U.S. Attorney General. Sen. Sessions has enormous integrity, fidelity to the rule of law, substantial experience and a commitment to fairness and equal justice under the law. Those are qualities America needs as its chief law enforcement officer to the Federal Government. Law enforcement is grateful for Chairman Grassley’s time and support and is confident the nomination will be confirmed expeditiously. Included in the meeting were Sheriffs from Florida, Indiana, Wisconsin, Ohio, and Louisiana, as well as representatives from The National Sheriffs’ Association (NSA) and the National Association of Police Organizations (NAPO). "Throughout his career, Senator Sessions has shown his full support of the law enforcement community and NAPO strongly believes he will serve us well as the next United States Attorney General", said National Association of Police Organizations (NAPO) Executive Director Bill Johnson. "We thank Chairman Grassley for taking the time to meet with us and we look forward to working with him to ensure Senator Sessions is confirmed as the next Attorney General."